This park is located along the Chena River and is accessible from Peger and Airport Roads. It’s the perfect place to get your ARTIC SLAM on while celebrating Alaska’s notable historical hallmarks, including the Gold Rush. There are playgrounds, picnic tables and even a carousel for you to enjoy after class. We will meet in the main parking lot (in front of the park) near the Alaska Salmon Bake. That is where we will begin class. Griffin Park is in the heart of downtown Fairbanks. The park is rich with the history of the city but also provides fields and footpaths along the Chena river making it the perfect backdrop to SLAM in AK. The starting point will be under the moose antler arch to the left of the Morris Thompson Cultural & Visitors Center at 101 Dunkel Street. There are multiple parking lots surrounding the Visitors center and park. Located in the heart of downtown Fairbanks, adjacent to one of our outdoor locations, Griffin Park, this church provides us with a warm and very large space to go about our SLAM business. There is a large parking lot alongside the church. Please go through the back double door entrance. We will be working out in the space on the ground level. Located in the heart of downtown Fairbanks, the Boys and Girls Club provides us with a warm and very large gym space to go about our SLAM business. Parking is located behind the building and there is a ramp for stroller access. Keep Up With SLAM'n Fairbanks! Join SLAM Fairbanks on Instagram! Contact the SLAM Fairbanks Team! Tiffany is a Registered Dietitian Nutritionist and has been an ACSM Certified Exercise Physiologist since 2011. She is CPR certified through AHA. 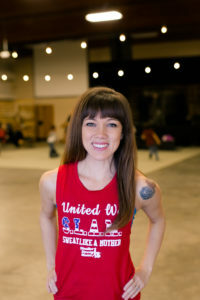 She has been a member of Stroller Strong Moms – Fairbanks since the beginning and started instructing the summer of 2016. From the first class, she was hooked. The workouts were creative, fun and challenging and the community of mamas and kiddos cannot be beat! 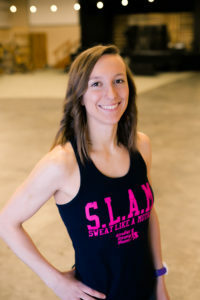 As an owner, Tiffany is excited to continue with SLAMazing workouts all while fostering the fun, dynamic and energizing community of Fairbanks SLAM sisters. Tiffany’s favorite ways to SLAM, besides SSM, are running, biking, hiking, and chasing around her three rambunctious boys. Stroller Strong Moms has been life-changing for me. I really don’t think I ever would have started exercising again if I hadn’t found it. Last year during the Get Fit Challenge, and the month following, I lost 15 pounds. I have kept that weight off this year, and now along with class 4 days a week, I am also training for my first half marathon in April. That is something I NEVER thought I would do. I am so thankful for all the delightful people I have met through SSM and I know that even when the Army moves us again, I will always find a way to stay fit thanks to all I have learned through SSM. Malia is an ACE certified group fitness instructor and CPR/First Aid certified. She has been a faithful member of Stroller Strong Moms – Fairbanks since the very beginning. Originally from Hawaii, this mama found her tribe in Alaska and couldn’t imagine life without her SLAM family. She is a boy mom to two little wilds and loves every crazy moment. 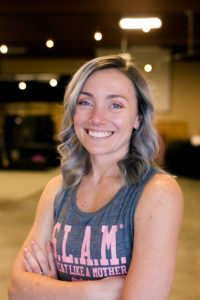 She enjoys a little friendly competition and helping Mamas and friends crush their fitness goals. Brittany is an ACE Certified Group Fitness Instructor with specializations in strength training for runners and running injury free. She is CPR certified through the American Red Cross. Brittany has lifelong experience in fitness as a both a former collegiate athlete and lover of endurance sports. As a military wife and mama to three kiddos, training regimens are flexible these days. She is truly a SLAMaholic, whether it’s logging miles for marathon training or creating a fun, yet challenging, dance routine for class. 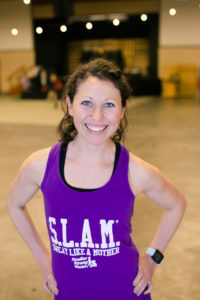 She loves a good long run and finds joy in a healthy balance of motherhood, running, and of course, SLAM! Nikki is an ACE Certified GFI and is CPR certified through the American Red Cross. Her husband’s Army career brought their little family to the interior of Alaska in 2017. About a year later after her second daughter was born she joined SLAM Fairbanks and her only regret is not coming to class sooner. One of her favorite things about SLAM is that her daughters get to see strong women build each other up and work hard to reach their goals daily. When she’s not at SLAM or doing all the mom things, you can find her running, reading or exploring with her family.